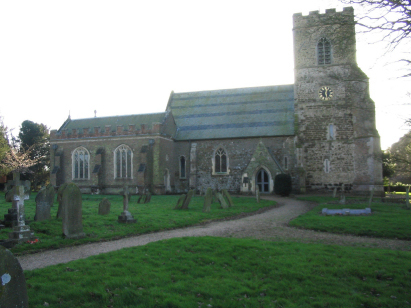 The parish of Stow Bardolph lies in western Norfolk, just north of the market town of Downham Market and adjacent to the busy A10 road linking King's Lynn with Ely & Cambridge. The village lies on the higher ground to the east of the Fens which are marked, here, by the River Great Ouse and various drainage channels. The land is sandy but still largely arable with large sugar beet fields interspersed with copses and windbreaks. Holy Trinity church has some features which indicate an early origin, traces of Norman features either in original or renewed have been identified. However most of the church, e.g. the nave and chancel, was completely rebuilt in the mid-Victorian period. 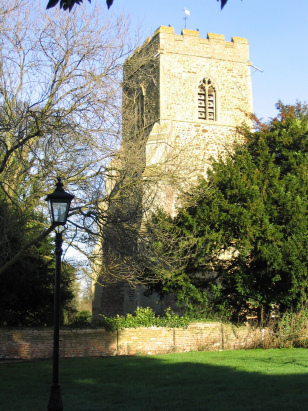 The tower is of a differing era being in the normal perpendicular style that dominates Norfolk. Much use of the local carrstone is present and this gives the church a lovely glow in the evening sunshine. The registers for Stow Bardolph for the period have not yet been deposited with the archive. However the parish has permitted a film to be made and it is from this filming, which is of high quality, that this transcript has been prepared. There are clearly three separate standard 800-entry register awaiting deposit all being obviously in a good state of preservation. As a result this was a straightforward transcript to prepare and it is to be hoped few errors will have crept into its production.